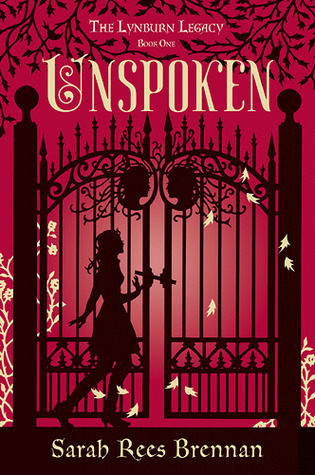 Unspoken by Sarah Rees Brennan. Random House, 2012. Currently Available. Face Value: I like this kind of cover, with the monochrome background and black and gold stenciling. It’s a familiar look in YA covers these days, but it’s one that I like. It also capture the gothic, spooky feeling of the story and means that we don’t have to grimace over a cover that is just Kami’s headless torso or something. Does it Break the Slate? Unequivocally. Kami is a fierce, smart, driven Slatebreaker and so is her friend group. She’s determined to find out the truth and do the right thing. Plus, Kami’s not the only Slatebreaking character in the book. Brennan’s complicated portrait of female friendships, and how a group of two can be expanded to a group of three is fantastically well crafted. Who would we give it to? Before I read this book I was hooked because of the multiple comparisons to our beloved Veronica Mars. A Veronica-like character and story is always something that’s going to appeal to me. Of course, this kind of comparison has let me down before, so I was wary as I started reading. Fortunately, my worries were for nothing. Kami’s similarities to Veronica come from her smart banter, quick wit, pursuit of the truth, and occasional willingness to put herself in danger because of it. The plot is not similar – there’s no father daughter detective agency or anything like that. The tone is similar. And because of that similar tone and equally strong story, Veronica Mars fans will be all over this one. Review: Kami Glass runs the school paper in her sleepy English hometown, Sorry-in-the-Vale. As an investigative journalist, she sees it as her job to tell her community the truth, so she sets out to explore the secrets of the Lynburn family, the wealthy and powerful family returning to Sorry-in-the-Vale after a long absence. Kami’s a bit of an outcast. Since childhood, she’s spoken to her imaginary friend Jared, only inside her head. As real as Jared seems to her, she knows he can’t be an actual person, and talking about him too much got her in trouble as a kid. So now she stays quiet about her conversations with Jared, but she knows he’s always there. But then suddenly, her worlds collide. The teenage Lynburn cousins arrive at her school and one of them – impossibly – is Jared. The same Jared. Faced with the fact that her imaginary friend is a living, breathing (and, let’s be real, attractive) person, Kami has to negotiate everything she’s always known, while trying to get to the bottom of some very real evil that is plaguing the town. There’s a lot of great stuff here. First, the plot of the mystery is well paced, engaging and just surprising enough. Secondly, the characters are outstanding. Kami is everything I want in a Slatebreaking heroine with her humor and strength and persistence. She’s bossy and stubborn, but always in the pursuit of her greater goal. Brennan does a great job of giving us a window into both her internal, emotional life that is shared only with Jared, and her external humor and attitude. But it’s actually Angela and Holly, Kami’s friends, who I really loved. I adored the character of Angela, who would do anything for Kami (her best friend), but who is also always on the lookout for a good place to take a nap. Angela’s wry humor made me laugh out loud at several places, and her emotional journey is fully realized, never being relegated to just the “token friend” role. And the addition of Holly’s character adds a whole new level of complexity to the exploration of female friendship in the story. Holly is a beautiful, conventionally popular girl, who Kami describes early on as someone who had “always been nice to Kami, but since she mostly hung around with a succession of guys, or several guys at once, they never really felt like friends.” But really, we learn, it’s Kami who has kind of shut Holly out, not the other way around, and that Holly is also a terrific friend and complicated character in her own right. The way that Brennan explores Holly’s inclusion in Kami and Angela’s friendship, and the way Kami has to confront her own prejudices about Holly’s looks and boyfriends, is really well done. I would be friends with all three of these girls in real life, and I appreciated the amount of time that was dedicated in the story to their friendship, alongside the complexities of mystery and romance. But there is romance, and that romance is a big part of the story. And once again, I want to give Brennan a ton of credit for writing a kind of paranormal romance that not only avoids some of the traditional traps of the genre, but questions them in a really interesting way. Instead of the oft-complained-about insta-love, we have two characters who have known each other for their entire lives, known with a depth that seemed impossible to be real. So when it turns out, it is real, they have almost the opposite problem. They know each other, and don’t know each other at all. It’s important, and terrifying, and they have to figure out what they mean to each other with all of this new information. Brennan does a great job of building this relationship on both levels. The scene where they figure out who the other one is, in an elevator at the library, I found to be particularly well written. “You don’t know any college guys,” Kami pointed out. Funny, smart & awesome. You should read this book. This entry was posted in Reviews, Young Adult and tagged Fantasy, Feminism, Friendship, Gothic, Mystery, Romance, Sarah Rees Brennan, Veronica Mars. Bookmark the permalink. Very awesome! I’ve heard so many great things about this book so I just bought it the other week. I can’t wait to read it! I think you’ll enjoy it. Let us know what you think! Yay! I’m so glad you loved this book as much as I did, and that the Veronica Mars comparison held up for you! Going into it, I was excited yet nervous, because Sarah Rees Brennan had so explicitly marked Veronica Mars as an inspiration, which could have been a disaster, and yet ta-da! She pulls it off. Have you read any of SRB’s other books? I have The Demon’s Lexicon out from the library right now and am thinking of reading it today. That or Beautiful Creatures. I’m in need of something fun and slightly fluffy. This is what happens when stupid cats wake me up at 6:30AM and then I decide to stay awake and write words on the Internet. Sigh. I liked but didn’t love Demon’s Lexicon. It’s definitely worth a read, but not quite as much my type of book. I couldn’t get into Beautiful Creatures, but now I do want to read it before the movie comes out, so I should probably get on that. And yes. Veronica Mars forever.